ALBUQUERQUE, N.M. -- Burglars can be sly and out of homes in seconds. City statistics reveal there are more than 6,000 burglaries in Albuquerque a year, yet only 8 percent are solved. To go inside a criminal’s mind, KOB went inside a prison. Burglary convict Raquel Rangel-Gutierrez admits she has broken into dozens of homes. "That’s probably what I lived off doing," Rangel said. KOB mailed more than 250 surveys to inmates and released convicts, asking them who they targeted and how they managed to get away with their crimes. Rangel is currently housed at the Western New Mexico Correctional Facility in Grants. She was among the 30 who responded. She agreed to discuss her survey responses in an on-camera interview. Rangel said she’d get through a sliding glass door or climb on the roof. "Oh, they’re easy to get in," Rangel said. "The glass doors are sliding doors. You just lift it up and slide it back." Her victims? Rangel said she would target someone, befriend them, distract them for a few hours and then call her accomplices to alert them to do the dirty work. "I'd say, 'Can you take me to the store?' and leave a back door open," Rangel said. "When we're at the store, I make a phone call and say, 'go ahead.'" Half of survey respondents, including Rangel, said security cameras didn’t matter. "If you can cut that wire ahead of time, or you can hit that camera to make it face the other way. Then you’re good," Rangel said. Once inside a home, 62 percent of convicts said the master bedroom was the first stop. "They would go straight to the master bedroom or course because that’s where the jewelry is at, the firearms," Rangel said. "The most expensive stuff is always in the master bedroom." Alarms didn’t stop Rangel, either. "Naw, they’re nothing," Rangel said. One-third of survey respondents said they would be gone before police arrived. Two-thirds said they would leave immediately. Many homeowners rely on man’s best friend to sound the alarm against intruders, but Rangel revealed dogs don't deter many burglars. "We would usually feed the dogs some morphine and put them to sleep then wait an hour or two then go," Rangel said. According to Albuquerque Police data in 2016, 7 percent of stolen clothing and furs were recovered. 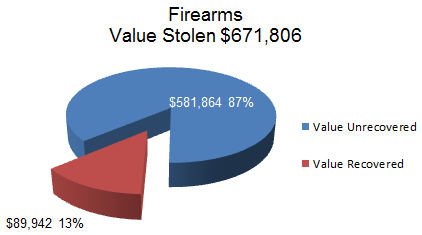 The same year, 13 percent of firearms were recovered and 2 percent of household items were recovered. 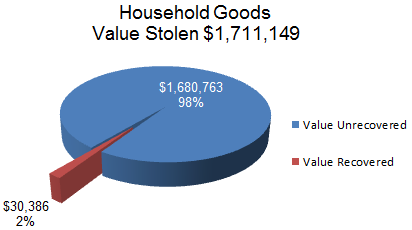 Rangel admitted that burglars don't hold on to stolen belongings for long. They almost always have a plan to quickly sell stolen goods. "You can take it straight to your dealer," she said. "You can take it straight to a pawn shop right away before it hits the screen that it’s stolen." Even when the police show within the hour, it's still enough time for a burglar to sell. "You figure they go home, they call the cops," Rangel said. "It takes an hour, a little more than an hour to do a whole investigation of the house, the police report and stuff. So you have less than two hours to get rid of everything." When Rangel cashed in, she said she would buy meth or crack. "I was an addict," she said. "I was on drugs." Rangel isn't alone; 42 percent of convicts admitted that a drug addiction was the primary reason why they burglarized someone. Raquel’s addiction caught up with her. The reason why she’s locked up now is because she and her son Malachi kidnapped and killed a man while burglarizing his home. "Malachi is my son. He’s my codefendant,” Rangel said. "My son took the charge of murder so I wouldn’t get life." Malachi is still serving time. "I took somebody’s life," Rangel said, "not once, but twice. You know?" Rangel is pessimistic that there’s a way to deter career criminals. "I don't think there’s any protection from people like us," Rangel said. "You can shoot us. You can be strapped and shoot us when we are in the middle of your house, but there’s always going to be a thousand more right behind us." There are ways homeowners can protect themselves and their belongings. Be wary of new friends, Rangel said, and put the most expensive valuables in a place other than the master bedroom. Rangel would avoid certain rooms — like children’s rooms — out of principle. Rangel also said silent alarm systems will notify the police but not the burglars, allowing the police to have a chance to catch the culprits before they have a chance to make a break for it. Rangel is looking for a change. While incarcerated, she has been taking classes to learn how to become a mortician. It will be her first job on the right side of the law. "I don’t want to wake up in the morning needing drugs," Rangel said. "I don’t want to wake up in morning the knowing I have to go out there and set somebody up." Rangel will be released in four months after serving more than a decade. Respondents said they could change the direction of the camera, break the camera, throw a cloth on the camera, climb on the roof to get around the camera, or cut a wire. Other convicts would cover their face before the break-in. Burglars under the influence of drugs would break-in without taking any camera precautions. 4. Did you target lower income or higher income neighborhoods? 5. Were you deterred by gated communities? Some respondents feared being cornered once inside the gated community. Some needed to know the way out before entering the gated community. 6. Were you deterred by dogs? Like Rangel, other convicts admitted to drugging a dog to put it to sleep. Barking is a deterrent. Other convicts would consider the breed before approaching the animal. 7. Did you care if the lights were on? Some convicts doubled checked to ensure the owners were gone, some knocked on the door to see if anyone would answer. 8. What room in the home was the most appealing? A few convicts, including Rangel, said the “kids room” was off limits. Burglars also considered office rooms to have a substantial amount of valuables. A few targeted the garage. 9. When you broke into a home, did you bring an accomplice? Some brought an accomplice in case something went wrong. A few didn’t trust accomplices. 10. When you broke into a home, was it typically a house of someone you knew? Some did not want to risk being “found out." Others felt it was easier to target people they had befriended. 11. Did you break into homes in your own neighborhood? Many convicts did not want their neighbors to learn that they were a burglar. Some did break into homes in their neighborhood because it was easier to transport stolen goods. 12. Did you prefer to avoid confrontation? Most did not want to risk getting caught. A few convicts would not break-in if children were present. A select few did not fear confrontation. 13. What attracted you to burglarizing a home? Many convicts admitted that they burglarized people to pay for a drug addiction. Most respondents who said they did it for the “thrill” also said they needed to pay for a drug addiction. Those who said they stole for their families said were not motivated by drugs. "It’s hard to avoid it when it’s your own home. You want to protect your stuff. These days burglars are scared of loud alarms and bright lights." "Hide from the burglar and do not let them know you are home. Call 911 and have an emergency evacuation plan out of the house and take a self-defense course." "Make sure no one is home." "Just let them take what they want and don’t make eye contact." "Scope out the residence first. Check times of going and coming for a couple of days." "Do not approach the burglar." "By remaining vigilant and being aware. Most burglars are high on drugs and don’t want a confrontation. If spotted, they take flight to avoid it." "Leave and call 911 or carry a firearm." "Just cooperate. I mean, in my personal experience, I never had to hurt anybody. But, cooperate and everything should be fine." "Seriously. Nothing. If it’s going to happen, it’s just going to happen. You be safe. Don’t try to stop him." "Run if they see people." "Report anything that would be suspect. Don’t bring any attention to themselves." "Don’t be in the way." "Yes, multiple, but all of the major solutions don’t exactly go towards the positive side of the law. It’s an epidemic." "I believe that most people break into homes and businesses because they need the money to support their addiction. As one addict comes to prison or another one gets recovered, there is another one born into addiction or trying a drug for the first time or sticking a needle in their arm. There will never be a solution to drug addiction or burglaries. However, there is always hope to overcome any obstacle. There is a way to stay safer. Addiction has no type." "No." Multiple survey respondents wrote this. "Help those who need assistance." "Just play Superman it if is happening." "Hire felons so they have a way to make money. Offer better drug treatment programs." "The only solution is to combat drugs and actually rehabilitate offenders. Sending them to prison only makes them worse. A small percentage of us are successful in being treated for drugs in prison." "I honestly don’t think there will ever be a solution. It is bound to happen to every few minutes a day. "No, there is always someone seeking the thrills or a need." "Yes. Need better security such as cameras and pets." "Not really. If a burglar wants something they are going to do whatever they can to get it." "Sorry, but no. Just the life we live today." "My last burglary resulted in death and here I sit years later with remorse, but it took a death to make me realize that the style of life wasn’t worth it." "No. people on drugs will do anything to stay high." 16. May KOB-TV schedule an interview with you to discuss your survey answers?